Summer’s just around the corner. 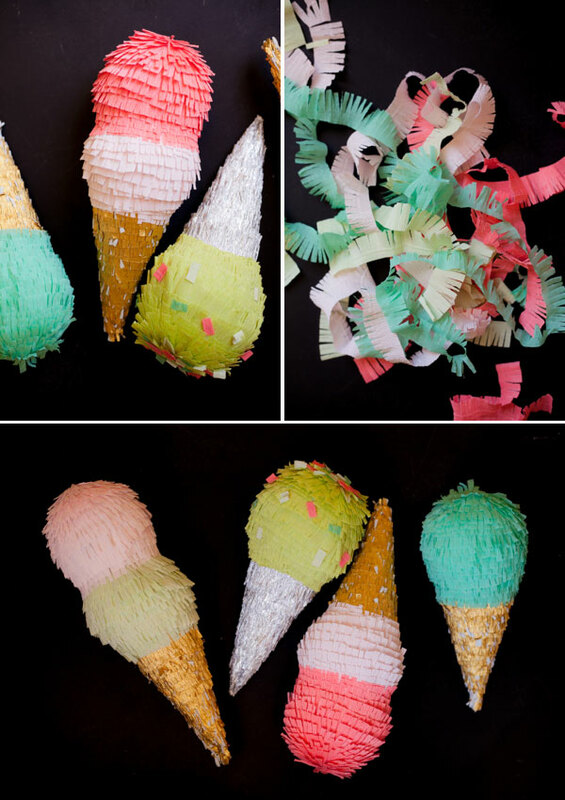 And these pinatas are perfect for a summertime party. They can be used as decorations, fill them with gifts and give to each person or you could fill them with candy for some traditional fun. 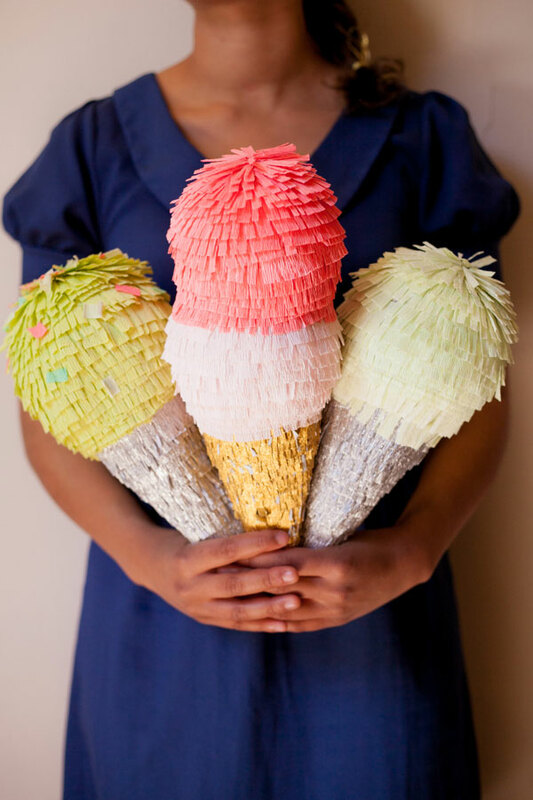 We made them with balloons, paper mache, and my favorite crepe paper fringe. 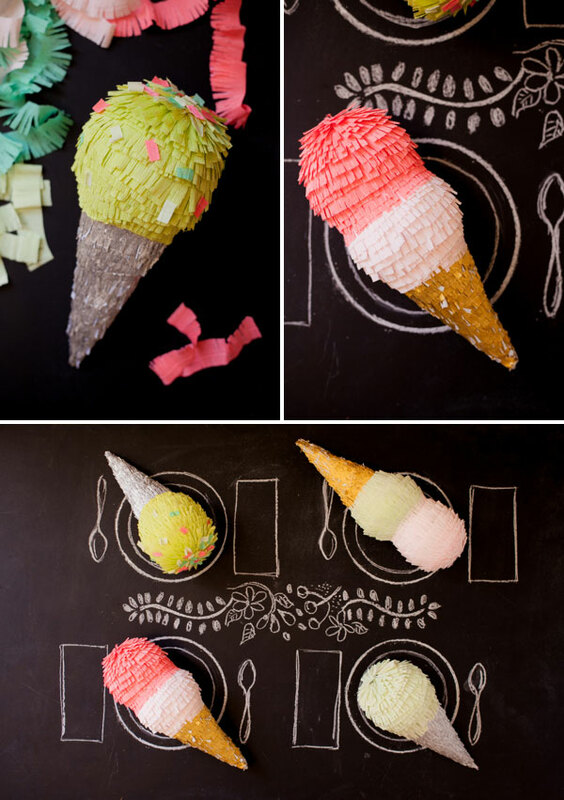 Try pairing them with my favorite Ice Cream Cone Garland for a fully themed event! Step 2: Pop the balloons and carefully cut off the bottom quarter of the paper mache balloon. Step 3: Download the cone template. Trace the template, then cut it out. Fold along the marked lines. Step 4: Add a strip of glue to the side flap and attach it to the other side to form a cone shape. Step 5: Add glue to the flaps on the top of the cone and attach it to the cut side of the paper mache balloon. Step 6: Cover the cone with paper mache and hang to dry overnight. Step 8: Top with fringe sprinkles, fill with goodies, and enjoy! So so cute! Perfect for an ice cream party! These would be perfect for my annual ice cream social! ah these are so cute! perfect for a party i’m hosting next month! thanks! Those are a great idea for a party! How did you come up with that? Love these!!!! Perfect for an ice cream lover like my self. I really love going to this site for inspiration, but ENOUGH of the pinatas in every shape possible already. I’m so sad to say I’m going to have to drop you from my reader for being so boring and uncreative. So Very cool to find this. I will attempt making one for my 3 yr olds bday! My goodness! 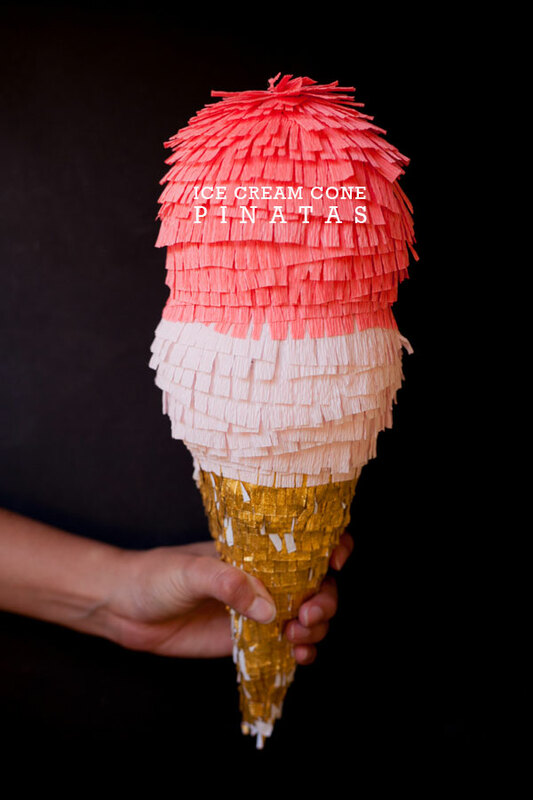 I am absolutely envisioning an ice cream themed party, where there are fun toppings awaiting inside the pinata! Doing this! Do you make your own paper fringe, or is it purchased from somewhere? Such a cute idea, and I love the colours you have used! These are great! I love your website, such cute ideas! hmm, not sure what marylinne is on about, boring and uncreative!? sounds like she’s being ironic! oh happy day RULES! Hi Jordan! love your blog and ideas! Sorry to ask but I didn’t understand when and how to fill the pinata with candys…. I’m trying this one this weekend althoug here in Argentina is autumm! This is my favorite pinata to date. Super cute! How cute!! This goes perfectly with out sorority theme for this spring’s class. Totally doing this!